Whenever I have an upset stomach, I make this dish. It’s easy to make, as all ingredients are boiled and then tossed together. 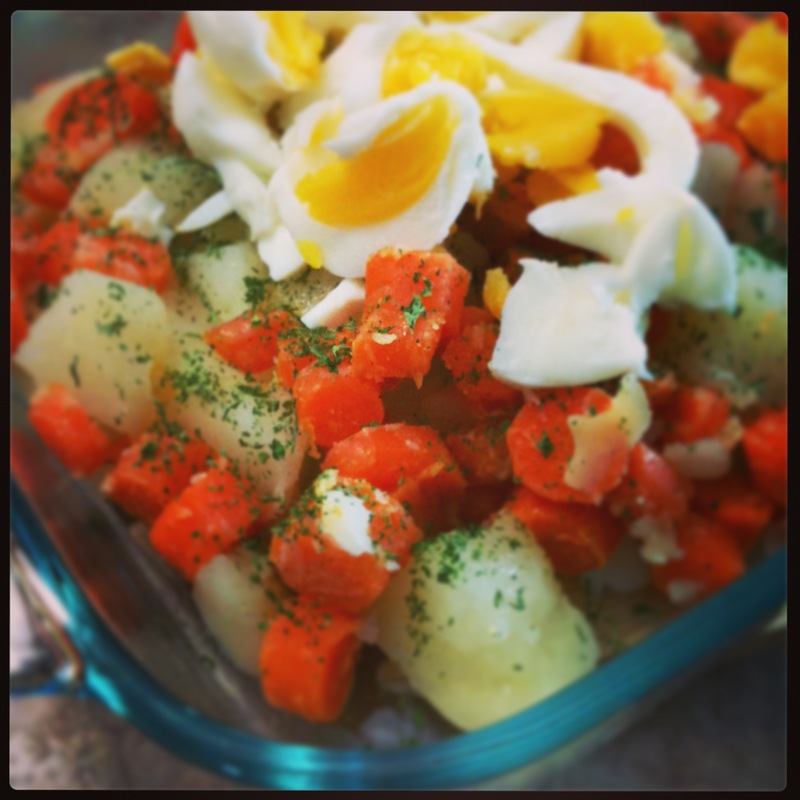 Ever since my friend first introduced me to this recipe, I cannot get enough of these potatoes! It takes around 10-15 minutes to prepare them and they’re ready in 30-45 minutes. 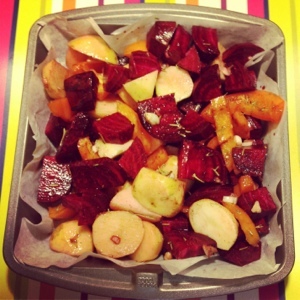 Another easy to make side dish: peel, cut, throw into the oven and eat. It takes 10 minutes to prepare the veggies and around 45 minutes to bake in the oven. You can add pretty much whatever veggies are in season and you can play with the herbs. For extra flavor, add Feta cheese (here’s another version of this recipe). For me, this dish has two main advantages: it’s easy and you can make a huge pot and refrigerate it for a week. You can also add more veggies – for instance, you can replace the potatoes (or one of the potato layers) with eggplants. For the basic version, you’ll need: 400 gr minced meat (I use a mixture of pork and beef, but if you want the healthy option, go for chicken or turkey), 6 large potatoes, 1 onion, 4 garlic cloves, 3-4 tomatoes and 1 small can of tomato sauce, 2 carrots (grated), cooking wine, oil, salt, pepper, basil, parsley (plus any other spices you like with your meat). Prepare the meat: saute chopped onion and garlic. You can either put the meat in the frying pan, add spices and cooking wine and sear for 2-3 minutes, or simply mix in a bowl the meat with the onion, garlic, spices and cooking wine. 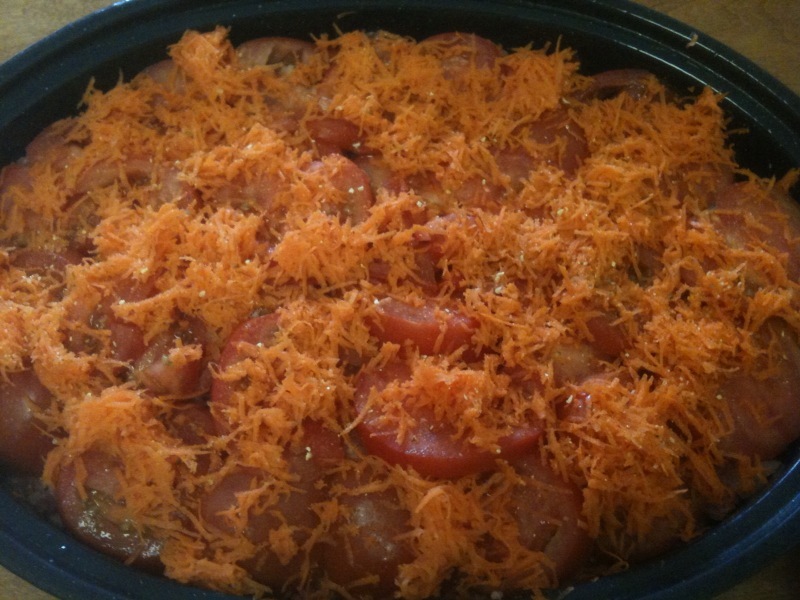 Add grated carrots for extra taste. Set aside. 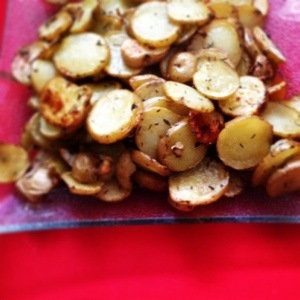 Peel potatoes and slice them (big, round slices). 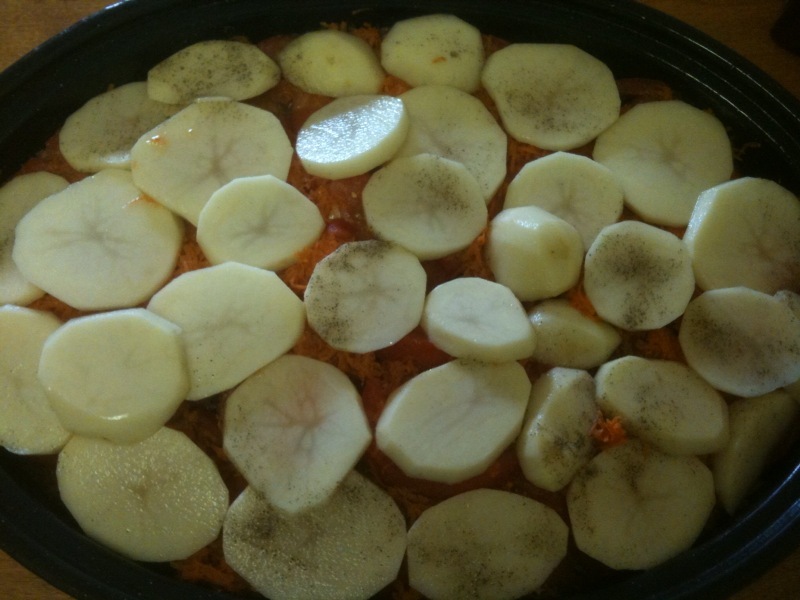 In a big oven proof dish, arrange potatoes into one layer. Spoon one layer of meat over the potatoes. Slice tomatoes and layer them on top of the meat. Finish with a second layer of potatoes. Add tomato sauce. If needed, use some more water (you want the whole dish to have enough liquid, otherwise it will dry up in the oven). Put in the oven for 45 minutes to one hour (or until potatoes are tender). My advice is to keep the lid on, otherwise the top layer will get really dry. Serve warm with cold sour cream or yogurt on top. I got the recipe for this side dish from a recipe book (Cooking for Today. One Pot. Parragon Publishing) and adapted it to my taste. The original was meant to be very spicy, as it included 4 dried chillies. The dish itself is very flavory and works well with any type of meat (maybe except fish). You’ll need: 4 red potatoes, 1/2 cauliflower (flowerets), 1 onion, garlic, and a range of spices like turmeric, cumin, gingerroot (I used ginger powder, which the recipe explicitly warned against, but it worked well in the end), paprika, salt and pepper. Soak cauliflower flowerets in cold water for 30 minutes. Meanwhile, peel and cut potatoes into cubes. Slice the onion and set aside. In a wide pan, heat some oil and add some cumin (the recipe said white cumin seeds, i used powdered cumin). Mix thoroughly and after 1 minute, add the onion. Cook for 3-5 minutes (or until onion becomes translucent). Remember to mix constantly. Add ginger, garlic, paprika, salt and turmeric and cook for 1-2 minutes. Add potatoes and cauliflower, mix well and add 2/3 cup water. Cover and simmer until the veggies are tender, adding more water if needed.